Heat the vegetable oil in a large saucepan over medium heat. Stir in the garlic and onion; cook and stir until the onion has softened and turned translucent, about 5 minutes. 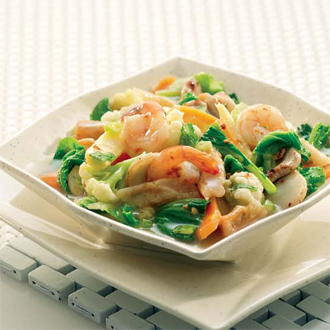 Add the shrimp, bok choy, broccoli, cauliflower, carrot, and green onion. Pour in the water, cover, and cook until the shrimp is no longer translucent in the center and the vegetables are tender, about 15 minutes. Dissolve the cornstarch into the fish sauce in a small bowl. Stir into the cap cai along with the oyster sauce, sugar, and pepper; stir until thickened. Season with salt before serving. You can use all kinds of vegetables you think will fit in, exp : baby corn, snow peas, broccoli, etc.